Last Saturday I made a road trip! I hooked up with my friend Carl, and we drove to St. Joseph, MO, to visit my friend Blair, and tour the city. St. Joseph has long intrigued me, mostly due to the comments on Old House Dreams when a house from the city is posted. It seems that a lot of people love the city due to its wealth of high-quality incredible old houses. And it seems that a lot of people are angry about how hostile the city is to the cause of preservation. I know several homeowners who gave up on the city and moved elsewhere. Surely though, such comments are exaggerations? Upon arriving, priority #1 was lunch! So, Blair drove us downtown and turned left to a fantastic work of architecture looming high above us. I gasped. I got out of the car and stood awestruck in front of the building (906 Sylvanie Street). The structure sat high up, above a retaining wall. Had the structure been altered? Had there been a porch along the front? …to the north side and at street level. How utterly extraordinary both in concept and design. Tragically, the door is no longer used. See the tower to the right? It second level was open (see the pierced brick?) and faced a terrace with a pergola overhead. Sadly, this is all now glassed in. You can see the garden door to the lower left. A matching entrance is hidden by a tree (center). The front door is to the left side of the building. The north side, showing the original main entrance. The new entrance is to the left, under the half dome. The half-dome is actually glass! This was the conservatory roof, and under it used to be leaded-glass windows forming a half-octagon. Blair said the Moss House had been a Shriners Lodge for many many decades. Since the mid-1970s the house has been Barbosa’s Restaurant. Blair, Carl, and I walked to the rear entrance under the half dome and I assumed the interior would be a horror with dropped acoustical ceilings and 4×8 paneling covering the walls with the occasional original mantel extant. Upon entrance, I was surprised. Pleasantly so. We entered through what had been the conservatory, and stepped into the reception room in front (now the cashier’s station). Next, through double pocket doors, was the parlor (above) and then the dining room (in the distance). The latter two rooms are now combined into one, and the impressive mantel is long gone. Most of the wood crown and wainscoting and doors are extant however. The reception room was largely intact and featured a remarkable mantel unlike anything I had ever seen. WHO designed this house? WHAT fabulous eccentric talent was responsible for this? I was gobsmacked. And all the wood in the house was in excellent condition with no alligatoring. The pocket doors from the reception room to the parlor. I knew, of course, that I had to take hardware shots for Bo! The staircase was surprisingly modest but nonetheless fascinating. See over the far lower right? All the spindles are like this: tall, thin, plain, and tapering top/bottom. You cam see petite versions upper left. The stair main window features a distinctive leaded-glass pattern. The pattern is repeated above almost all the windows in the house. There was no way I was going to leave without getting into the attic. This is the room atop the center tower. I WAS THERE! You can see the leaded-glass transom windows. See also the petite tower clinging to the main square tower? See its small window on the second floor? Here it is from inside!!!!!!!! A board runs right across the window, holding original coat hooks. Just delicious! A block to the north is another amazing pile, looming high above. I love high above houses. Geez Louise. And look at the astonishing stonework at the entrance gate! The Moss House was both exhilarating…and depressing. The house is not falling apart and it is clear that the long-term owners have done what has been required to keep the house in good order, like replacing the slate roof at great expense. The house though is not, well, gleaming and perfect. Important features like the conservatory have been largely destroyed while other vital features like the second-floor terrace have been compromised. Several original windows have been awkwardly replaced. None of the windows have been restored. The staircase is missing bits and spindles. The parlor mantel is long gone. All old house after a century suffer from the ravages of time and I had a desperate ache to wrap up the Moss House in my arms and polish it to its original luster. And not for the first time I thought: Why aren’t I rich? With my heart all an-ache, we departed. Carl had previously been to St. Joseph and he described a house he had seen to Blair. Blair knew just the house and we were soon standing before a structure which blew my mind. Look at the brickwork, how subtly it forms a curved turret. Note how the brickwork at the bottom of the turret incrementally melts into the wall plane. I knew in an instant that I was standing before the work of an immense talent. Later sleuthing revealed this as the J. W. McAlister Residence, at 105 N 19th Street. 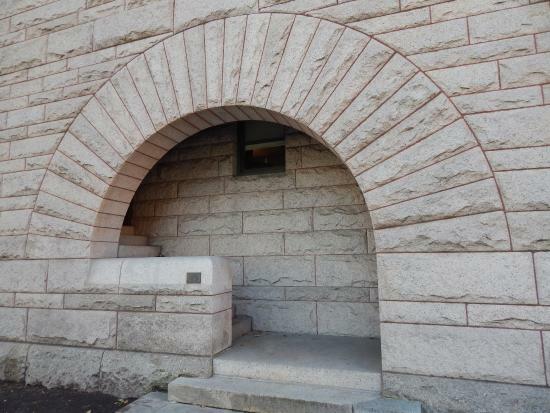 See the dramatic stone arch at the front door? As I stood before the McAlister house I thought: Didn’t I just see that? Why, I had. I just had. Blair then drove us to another house which thrilled me. The McNeeley residence, at 701 S 11th Street. Hey! I knew this house! …the roof had been redone, and the retaining wall replaced. What I had loved about the house was that it was by an obscure but brilliant architected named Harvey Ellis. The exterior abounds with luscious, extraordinary detailing. I see a whole lot of yumminess. And not JUST a sideboard but a sideboard in an arched niche and with a stained-glass window. The upper landing. The simple yet distinctive spindles exactly match those at the Moss House. Another fascinating house we saw was the S. M. Nave Residence at 2121 Clay Street. It was only the next day that I discovered a common theme to the Moss, McAlister, McNeeley, and Nave houses: All were designed by Harvey Ellis. And suddenly everything made sense. Of course these structures which were so inventive were created the same person, and of course Ellis was that person. Ellis was never a huge name. Although well-known among the architectural community in his day, he was never famous. He died young at 52-years old. He worked for numerous established architects and his work is normally attributed to their names rather than his. Ellis was also a brilliant architectural draftsman, and a sought-after employee. The three originals renderings shown above are by Ellis. …the similarities to the Moss House. Very little is known about Ellis yet his work, more than a century later, still surprises and delights. The McNeeley House seems in a desperate condition even with its new roof. The interior images (taken from Old House Dreams) show a highly damaged interior. 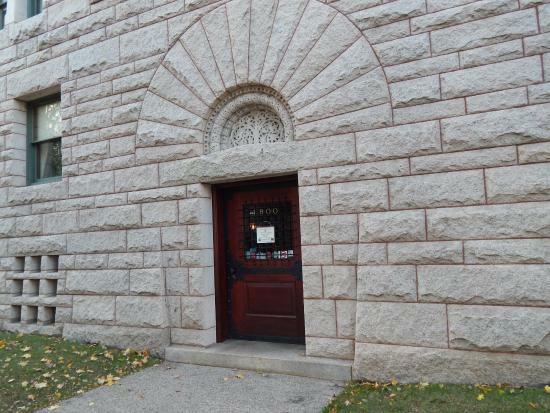 Much of the exterior stone needs replacing STAT. And, worst of all, is the immediate neighborhood which is grim. After our whirlwind tour, the comments about the city which I read for years on Old House Dreams made sense. I do not recall visiting a city with such a wealth of stunning and remarkable architecture, extraordinary architecture, yet which nonetheless offered an overall impression of…dereliction. I did not see a single street lined with restored houses. Rather, there would be a burnished knock-out and then, across the street, a boarded-up house or a burned-out house or a shabby slum-like house. I told Blair that I felt like I had traveled to 1975, an age when cities had zero preservation consciousness. In Newport, Rhode Island, where I used to live, the Point Section in the 1970s was considered a slum by the city which intended to raze it to the ground. A small group of citizens fought back and today the Point is one of the most desirable places to live in the city, filled with magnificently restored houses as far as the eye can see. Even Detroit, the poster child for urban decay, has intact and luscious neighborhoods. Countless neighborhoods in America have been brought back from ruination since the 1970s. But the leaders of St. Joseph seem trapped in a 1970s anti-preservation mindset. I had assumed that the city had suffered a catastrophic population decline, as this often creates the depressing conditions seen in St. Joseph but a quick internet search revealed, to my utter astonishment, that the population of the city has been stable since 1910 at about 77,000. So, why so many empty lots, burned-out buildings, and general dereliction? In Kansas, hundreds of historic buildings have been restored through its innovative Heritage Trust Grant program, started in the early 1990s. My own Cross House has receive two substantial grants, which have and will largely restore the exterior to pristine condition. But magnificent building like the Moss House which, if they were located just a bit to the west could benefit from the Heritage Trust, are left to languish. St. Joseph has such a wealth of glorious architecture that the city could become a magnet for tourists and people seeking fabulous old affordable houses. If I were running the city, I would create a fund to gloriously restore the Moss House. Then I would create housing on the empty lots across the street. I would gloriously restore the McNeeley House. Then I would purchase the derelict but not unattractive historic housing across the street and restore them, too. As well as with some neighboring houses. This is directly across the street from the McNeeley House. These duplex structures COULD be gorgeous. Investing in a city like this has proven time after time to be a wise investment. And I have no doubt that the brave preservationists of St. Joseph have been using the same argument for decades…only to fall upon deaf ears. An entire city…as a tragedy. Wonderful houses. I see Richardson and Richard Morris Hunt (and even a bit of Frank Furness), but Mr. Ellis’s talent stands clear of them. When I used to come up to St Joe from KC to see pts (catastrophic case manager— folks injured on job— St Joe person run over by steamroller— not 1 broken bone— miraculous! ) used to spend extra time viewing the sumptuous houses! Also seeing friends & loved ones. Amazing amazing pics shared today. I wish you were rich too Ross. What beautiful old interesting houses slowly heading for deriliction. Kansas has been very wise and very long sighted helping people to restore their architectural gems. How dare you not invite me to St. Joseph? I have lusted after this city like you too with all the amazing architecture in the city and the Moss house, a house I have wanted to see the inside for years and there you go strolling in and showing me what I have wondered about all these years. I am so envious. I wish us old house people could form an organization that helps restore these homes and gets them into the hands of people who would actually love them and take care of them. I was thinking about it the other day and realized that to do good, to do right by an old masterpiece takes so much work and money. However to do bad, to be a poor steward and let a property fall into ruin takes nothing and for many people makes them money by renting them out and keeping the money themselves. It seems so unjust and I ask myself why it has to be this way. Why the cards are stacked against the good and set in favor of the bad? What can we do but keep fighting the fight. Let’s do a St Joe tour! You just let me know when, and I’ll meet you there! While I am still in St. Joe, I can accommodate the tour. Ross still has a lot to see. My lovely wife and I would be tempted to join, if you could stand the company. I love the idea of a mob descending on St. Joe! And it would be fabulous meeting you! I love old houses and old cities. An old city tour would be amazing. You are 100% correct Ross about restoration bringing back a neighborhood to greatness. I lived in Brooklyn in the bad (but good) old 70s when everyone was scared and you could buy a brownstone for $4500.That is not a typo. Now they are $1,450,000. I have never been to the Midwest but you have some beautiful homes and cities there. I find a lot of peace reading Ross and Old House Dreams. I wish you were rich Ross and me too. I have done some restoring on my 1923 house, but I have always wanted to restore a big, big old house. This was a great post Ross. I hope it inspires St Joe to appreciate their bounty. If I knew then what I know now I would have snapped up every NYC townhouse or apartment I could have! Oh, and purchased a LOT of Apple stock in 1998! We’ve actually met. We had a house tour in April last year. It was lovely, but not quite as lovely as it would be now. Yikes! I am a ding-dong! You have plenty else to concern yourself with. We aren’t particularly memorable– especially compared to your work– and we managed to get away without any photographic record of the event. It isn’t just St Joe….It is the whole state of Missouri…. I don’t think it is just old houses that are ignored. We moved to Arkansas from Austin, Texas. The major cities in Texas are more liberal and educated, and then of course is everywhere else. Now we are in Eureka Springs, Arkansas and up close to Missouri and get a lot of their news. There seems to be a strange dichotomy in politics, news, etc. I’m not sure if it is a Southern thing or what (even though I was born and raised in Texas and it didn’t use to seem this way). Sometimes things are done that make really good sense and then we hear something really stupid. So letting these beautiful properties decay with no help when there would be ways to save them AND help their tourist industry, doesn’t surprise me at all. And yes, even though most of us would like to be millionaires, there should certainly be a cadre of people like you in charge of making it all happen. That is if there were two of you and one of you could still work on the Cross hose and keep us abreast of your progress (and your thoughts on Pumpkinhead, who I also despise).